What kind of image file? Are you referring to the image file that can be uploaded in the "File Upload" tool? You can actually limit of what type of file can be uploaded in your form. 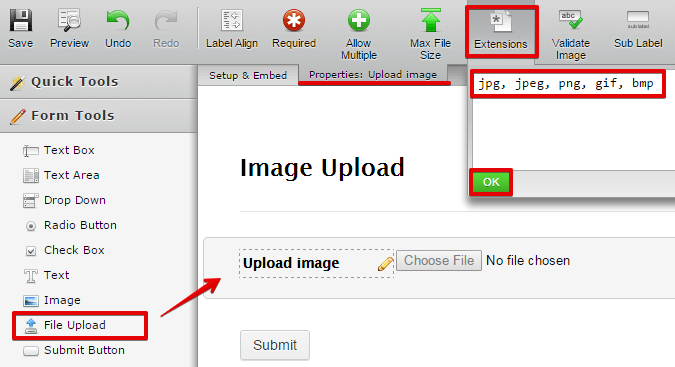 Click the File upload field and then click the "Extensions" option in the top toolbar. You'll see a box here where you can put the allowed file extensions in your form. If you're planning to receive any image file, then you can put all of them. Let us know if this is not what you're referring to so that we can further assist you. However, please provide more details about the issue so we can help you properly. Thank you.